Bridge the gap between your shop floor & online store: introducing Proximity Marketing & Beacon Technology. Proximity Marketing is the localised wireless delivery of marketing content associated with a particular place or offer. Marketing messages can be received by consumers within the targeted location that chooses to receive them & have the necessary apps/settings to do so. Broadcasts are generally in the form of an advertisement, offers, incentives or simply just information, going directly to your customer’s mobile device your marketing communications can now be crafted based on the location of the beacon. A Mobile phone in the target range or specific type of phone (iPhone, Android etc). A Bluetooth or WiFi device within range of a broadcast or Beacon. An Internet-enabled device using GPS enabling it to request localised content from internet servers. A phone using a RFID chip on a product or media can launch localised content from internet servers. Broadcasts targeted to specific groups within a given location, for example, content in tourist hot spots may only be distributed to devices registered outside the local area. Furthermore, broadcasts may be both time & place specific, content at a conference venue can change depending on the event in progress, or in a nightclub where depending on what room you enter depends on what drink offers you will receive. Uses of proximity marketing include broadcasts of media at concerts, information, gaming, social applications, marketing & more. Apps are increasing in popularity with businesses daily as they try & identify new opportunities with their audiences. Therefore, mobile marketers have increasingly taken advantage of smartphone apps as an effective marketing resource. Having an app isn’t just a new channel, it’s a jam-packed hub of data and endless engagement possibilities. It can tell you how your customers move about their life when not in your store, & how they choose to interact with your brand. The app will let you see what the users want & give you the option to tailor the demand to them. Constantly analysing the results you can turn that one off win into a weekly buyer by providing the satisfaction they desire. Take the leap of faith with personalised marketing. 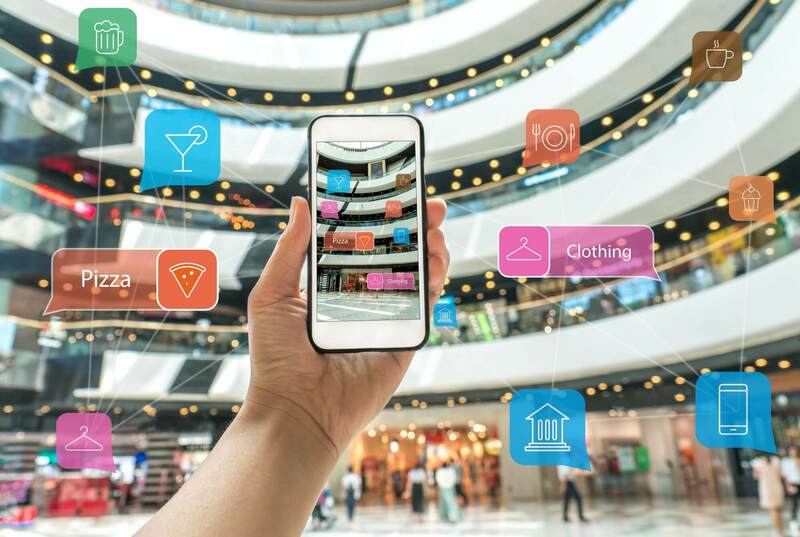 Driving sales - Fashion retail use apps to offer discounts and incentives to their users, such as a launch of a new range a user could receive a 20% off while the rest would not get that. Returning custom - Nightclubs are always looking at ways to bring more people through the door compared to their rivals, having a loyalty programme they could offer heavily discounted entry fees or unique drink prices to users part of their loyalty programme. Boosting engagement - Theme parks can offer the above to app users they would also give feedback on problems they find at the park or ways that services can be improved to make the users visit more pleasurable. The park could also send out questionnaires & offer incentives for answering questions. Loyalty - Linking with the returning custom if you want continued custom & positive results from your users you have to offer some sort of personalised loyalty programme or recurring incentives for continued custom. A tactic used by well know smoothie & coffee shops. Increased awareness - Festivals are always best sold by big headliners & word of mouth, using an app to offer incentives for those who share your app or message any & every business is always looking for more awareness in this tough world. Personalised marketing - This is what makes you stand out while using beacons can throw out push notifications & send users to a one-off win situation, the app lets you customise how your message looks, you can showcase your brand values & reach a new level of personal engagement with your custom audience. Major restaurants, such as KFC or Burger King, can send coupons or offers to apply for free food or to enrol in their loyalty or rewards programmes. Hotels can inform guests about events and promotions or can offer to enrol them in loyalty or rewards programmes. Nightclubs can offer drink & discounted entry fees to people to entice them in off the street without using promoters and banners. Shopping centres can offer a proximity marketing benefit to their tenants by putting together a package of coupons or offer a discount at any retailer. Travel hubs such as airports & public transportation centres can provide maps or display ads that can be sold to local tourist destinations. General information about a product or service can be delivered through proximity marketing even if the fixed location of the business or service agency changes. Want to find out more about Beacons? Say hello using the form below & pop in for a chat.